Mildred Cohn (1913-2009) was a biochemist who advanced the study of metabolic processes, research that contributed to the development of medical technologies like the magnetic resonance imaging (MRI). She started her career in physics, reaching new frontiers in understanding chemical reactions at the atomic level. Using innovative technologies -- mass spectrometer, nuclear magnetic resonance, and electronic paramagnetic resonance -- to elucidate organic reactions. Her research included metabolic studies, mechanisms of enzymatic reactions, adenosine triphosphate (ATP) and electron spin. The image galleries below highlight some of the important work done by Cohn and offer a glimpse of of what this valuable collection has to offer. To learn more about Mildred Cohn, and to use the collection, visit the finding aid here. This exhibit was written and curated by Ann Reinhardt. 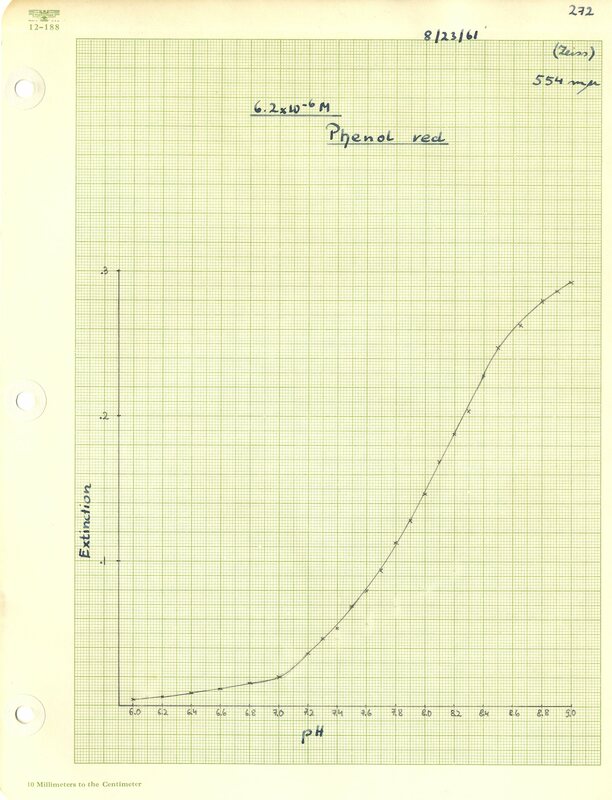 The Cohn Papers at the APS are a rich source on the role of instruments and laboratory techniques in biochemistry and biophysics. 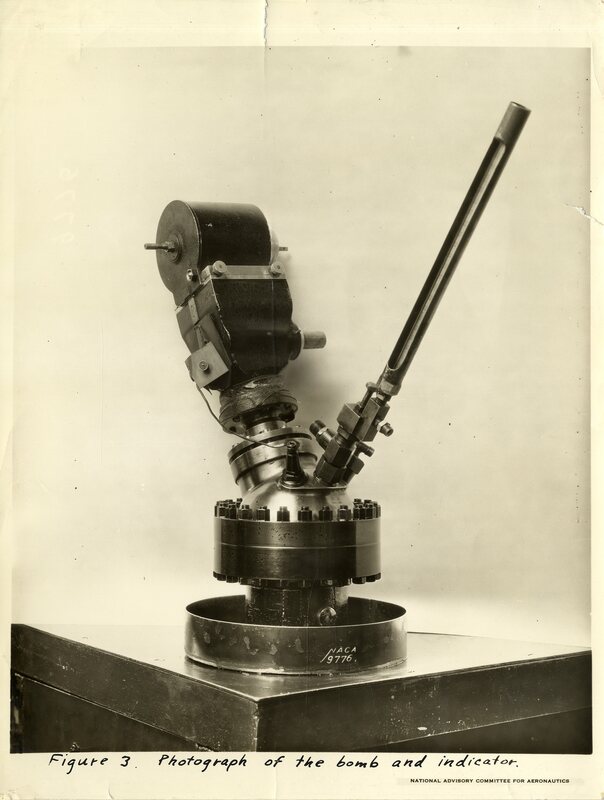 Here are illustrations of the nuclear magnetic resonance tool plus other instruments Mildred Cohn worked with and helped develop. 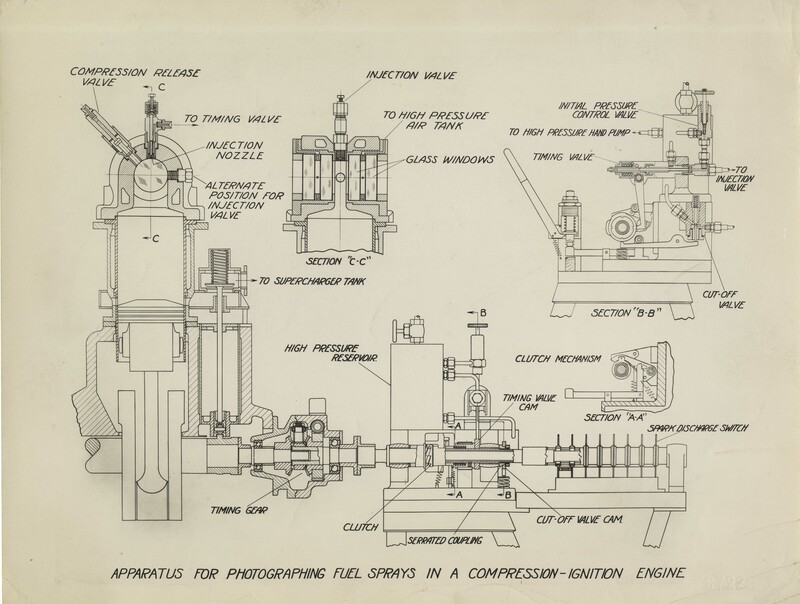 Schematic drawing of an apparatus for photographing fuel sprays in a compression-ignition engine. 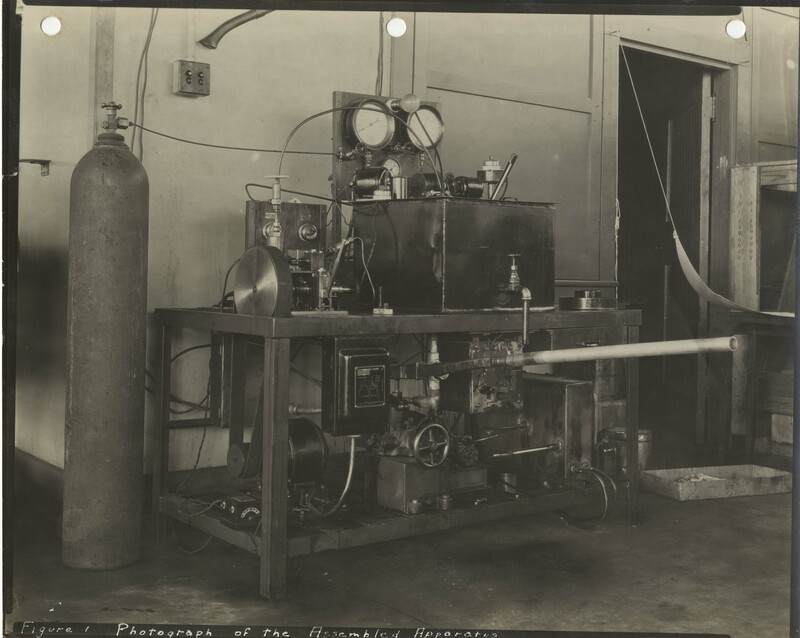 Photograph of the apparatus as assembled in Cohn's lab. 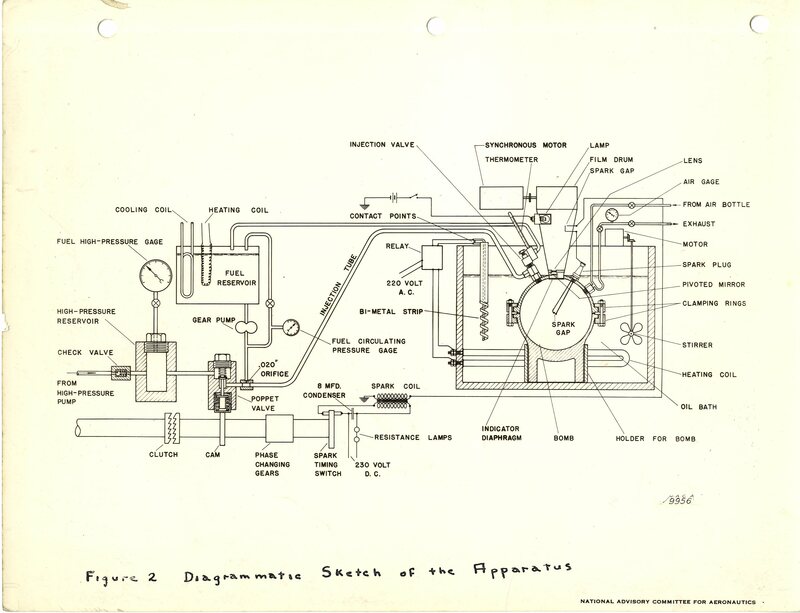 Diagrammatic Sketch of the Apparatus. 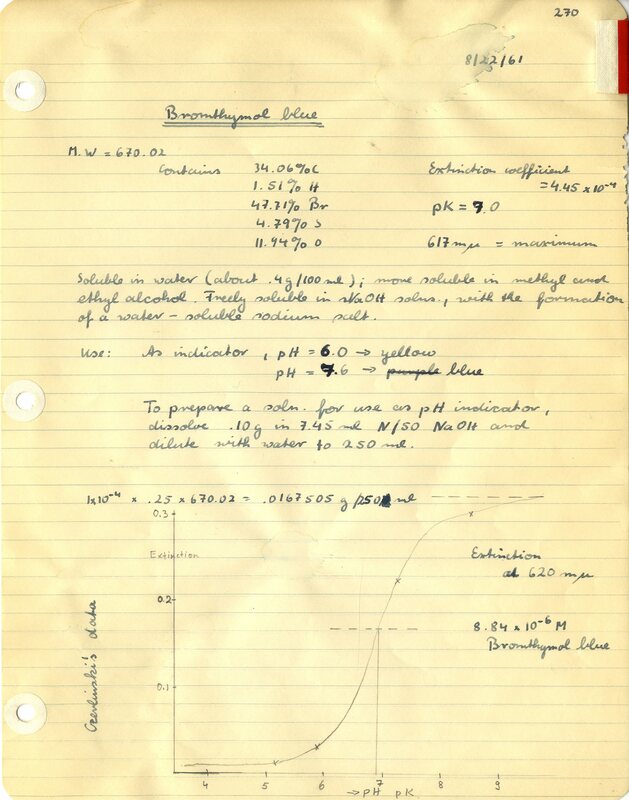 Photograph of the bomb and indicator. 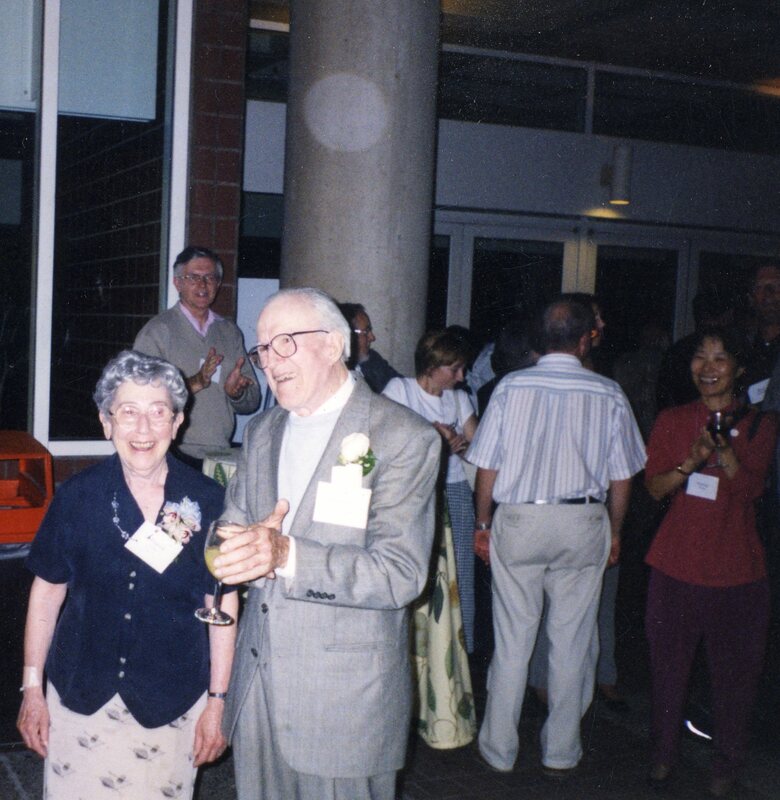 During her career, Cohn achieved several gender firsts: She was the first woman to be appointed to the editorial board of the Journal of Biological Chemistry, here she served as editor from 1958-1963 and from 1968-1973. She was the first female career investigator for the American Heart Association. 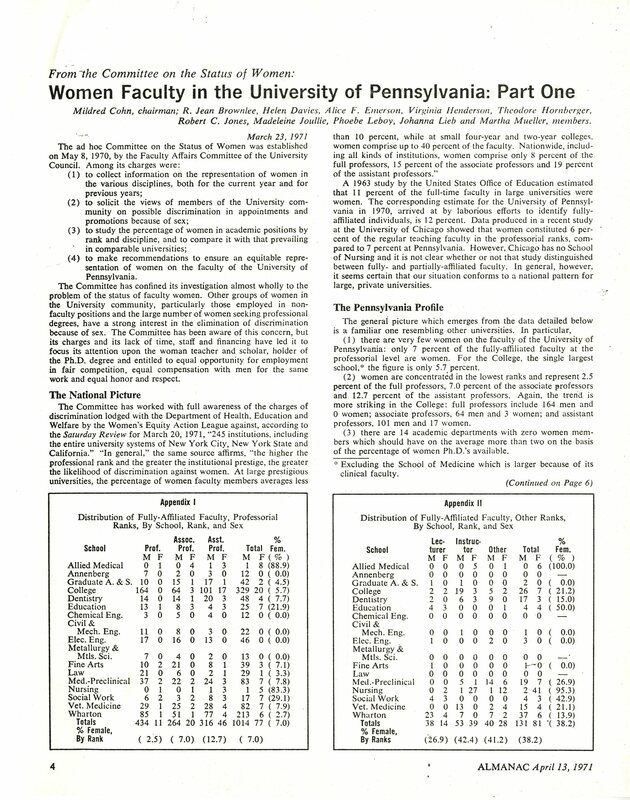 At the University of Pennsylvania, she was appointed full professorship in 1961. The manuscripts displayed here highlight these groundbreaking accomplishments. 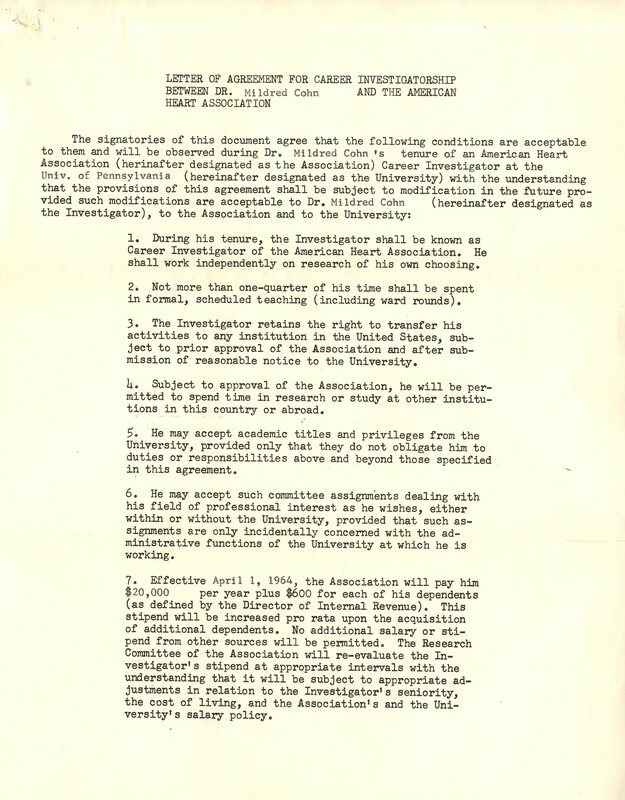 Letter of agreement between Mildred Cohn and the American Heart Association outlining the conditions of her tenure as an American Heart Association Career Investigator at the University of Pennsylvania. 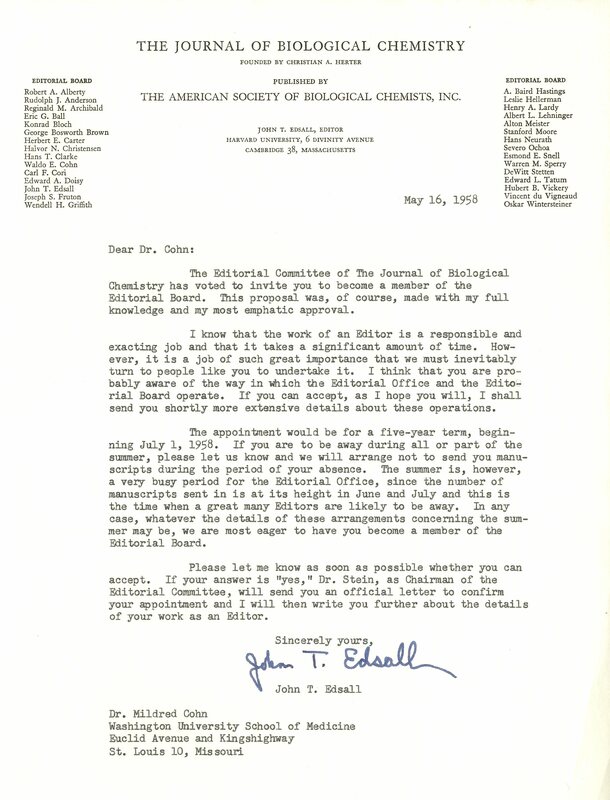 Letter inviting Dr. Cohn to join the Editorial Board of the Journal of Biological Chemistry. She was the first woman to hold this position. 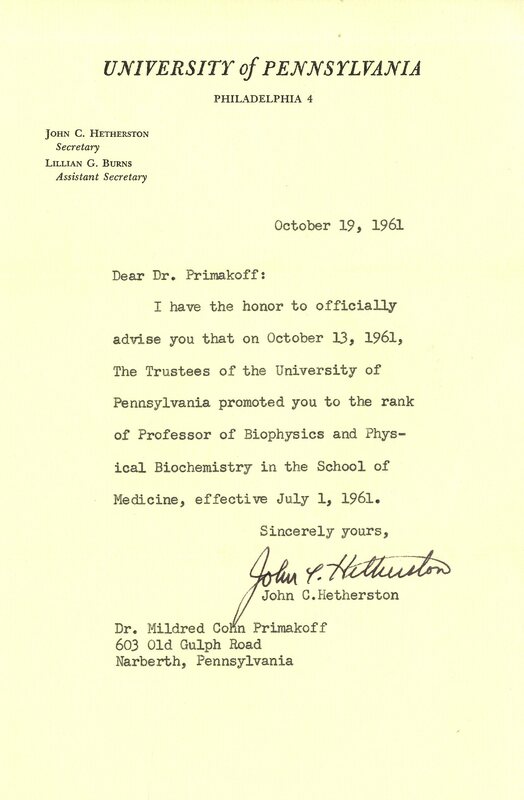 Letter promoting Dr. Cohn to the rank of Full Professor of Biophysics and Physical Biochemistry at the University of Pennsylvania. ...and in a detailed study undertaken here. 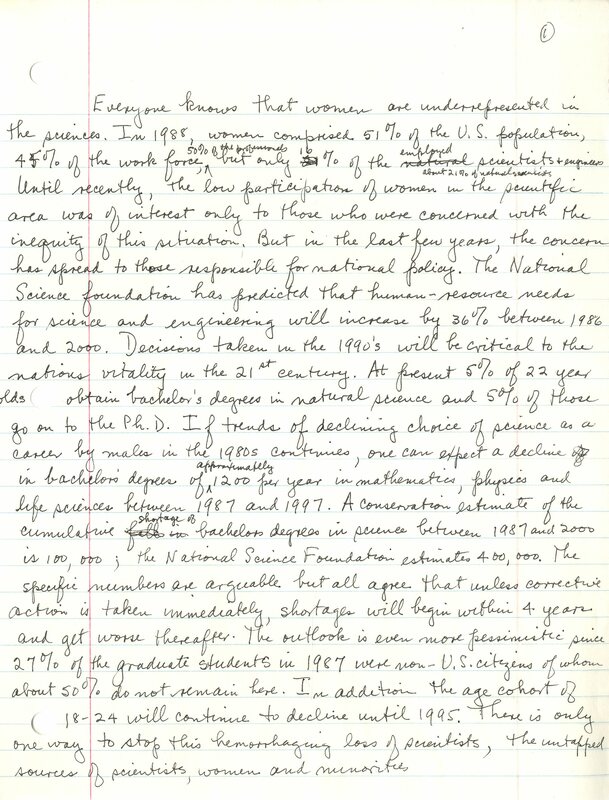 The Cohn papers contain many of her research notebooks with detailed examples of her studies, as well as correspondence discussing her collaborations with many notable contemporaries. 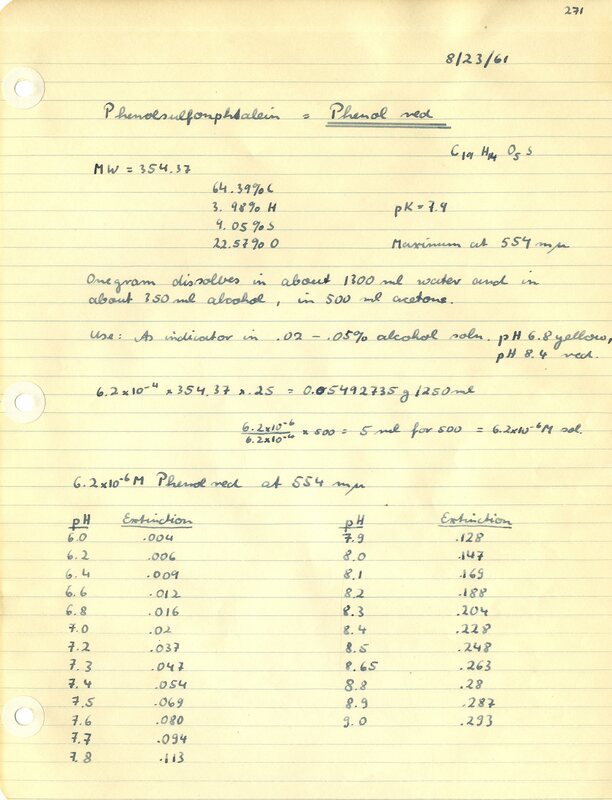 Notes on her enzyme indicator from 1961. 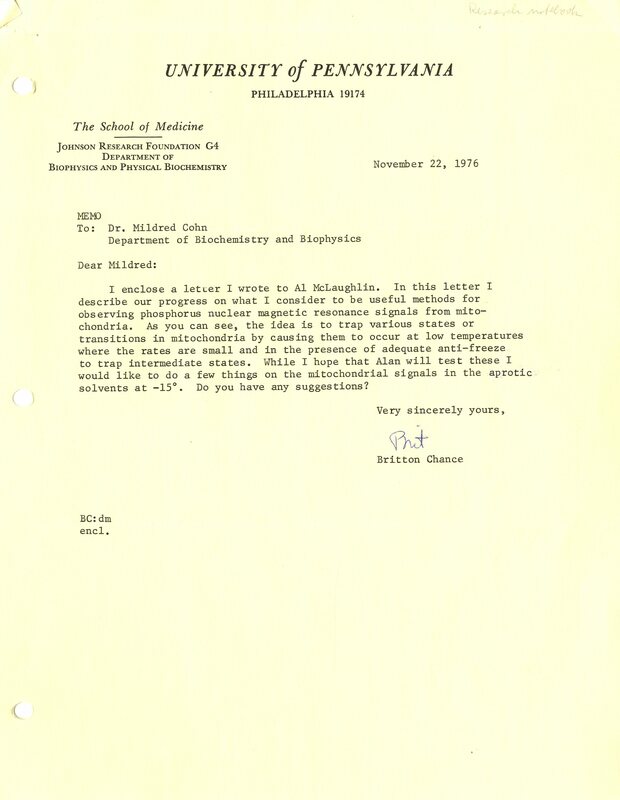 Letter from Britton Chance, University of Pennsylvania, discussing useful methods for observing phosphorus nuclear magnetic resonance signals in mitochondria. 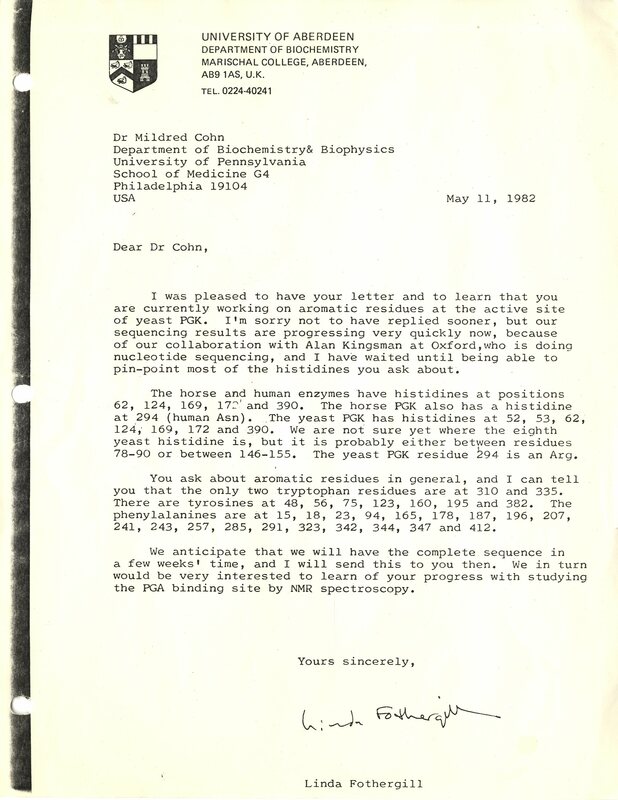 Letter from Ian Armitage, Yale University, discussing Cohn's NMR studies. 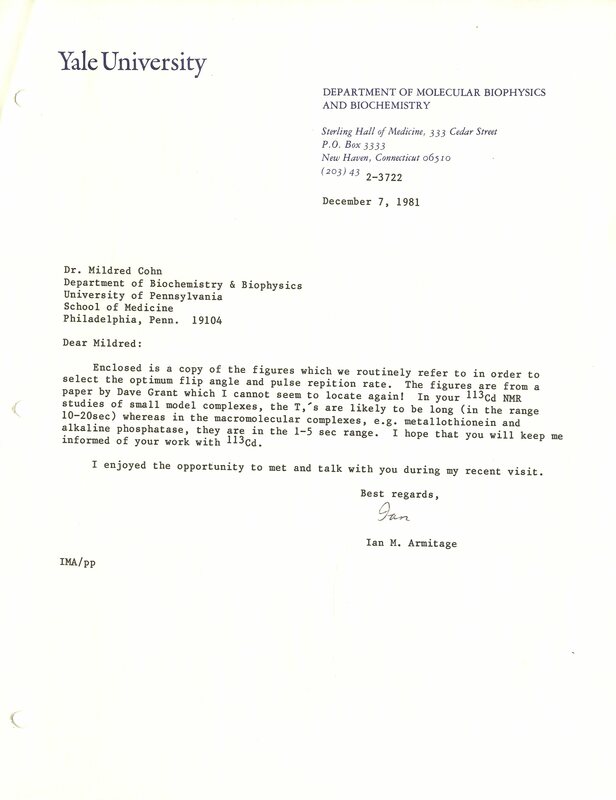 Letter from Linda Fothergill, Aberdeen University, regarding Cohn's study of certain yeasts. In addition to their shared interest in biochemistry, Mildred Cohn and Britton Chance, having been born just twelve days apart in 1913, also shared several birthday celebrations. Here they are celebrating their 90th birthday together.